I got to say, social media and the way we interact is pretty phenomenal. And I mean that in all possible ways. I do love it. Being able to connect fast and furiously with people. Meeting new and interesting folks all the time. Being able to exchange links to pictures, recipes, news almost instantly. I like hearing my phone send me a little ring-a-ding "you got mail". Really I do! Last week, I posted on Flickr a photo of tapioca puddings and lemon poppy seed muffins I was taking to our neighbors for dinner. I linked that to Twitter and then closed the computer and went next door. My phone in my pocket. Then my phone had a party. All by itself. It started ring-a-dinging with intensity. Tweets back and emails started coming in asking me to please share the recipes for the puddings and the muffins. To tell you the truth I had not really planned on it but I had made more than enough to share with more friends. Here. One spoonful deep in that dessert, one whiff of lemon and poppy seed later and I was secretly giddy to have an opportunity to sample them again. 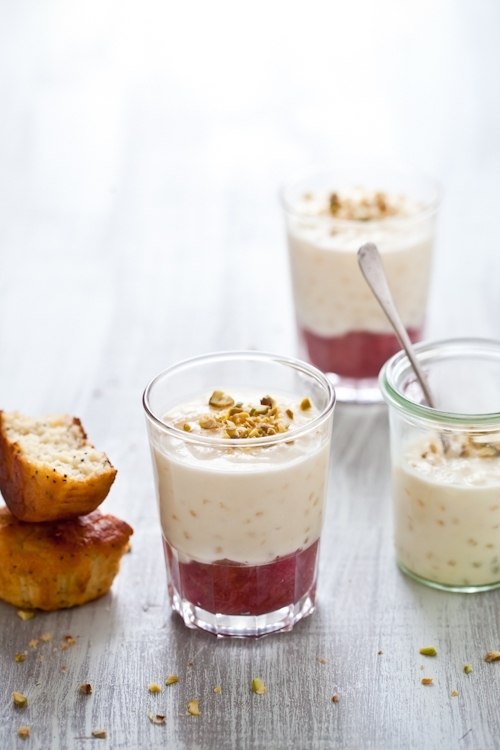 The Raspberry Rhubarb Tapioca Puddings are so good. Soothing. Little beads of tapioca rolling off your tongue. Smooth. Rhubarb and raspberries gently cooked until just barely soft. The distant scent of cherry blossom extract. The perfect crunch of lightly roasted pistachios. And the muffins. Ah...gobbled up in a flash. Good thing I tend to cook and bake like my grandmother. Doubling a recipe, or more, is just a normal thing happening here. What can I say? I love to give and see the smile on someone's face when they receive. The lovely part with these muffins is you can built upon the base any way your heart desires. Oranges, instead of lemons, nuts instead of poppy seeds, vanilla, rose, caramel...anything. Quite a few many events are shaping up for this Spring and Summer (actually up 'til January...ugh!) that have me jumping up and down with excitement! I will make sure to keep everyone updated on workshops or conferences. Right now I must get the house and studio tidied up a bit since Taylor is coming tomorrow and staying a few days to shoot the promo video of my book "Plate To Pixel". I heard the book was officially shipping out next week! I am extremely nervous but glad we practiced a little a few months ago. Remember this? I can't believe this is all happenings. Months of hard work just about to see the light! Another fun little tidbit that I forgot to post here: last month the printed issue of Elle Magazine published a feature "Cooking In Code" for which I was interviewed along with Heidi of 101 Cookbooks and Molly of Orangette as well as Eddie Gehman Kohan, Krista Garcia, Amanda Kludt. Extremely honored. Well, now the online version is live on the Elle magazine website. Click on any of our pretty mugs and you'll be able to catch up on our interviews. Ok...now I must really go clean the house for Taylor. I'll try to post sneak peeks of the shoot with Taylor throughout the weekend. Should be fun! In a large saucepan, combine the rhubarb, raspberries and lemon juice and bring to a boil. Reduce heat to low, to a simmer, add the honey and stir briefly. Cover the saucepan and let cook for about 10 minutes. Uncover and check the fruit. If there is a lot of liquid, cook a bit longer over low heat, uncovered until very little liquid remains at the bottom of the pan. 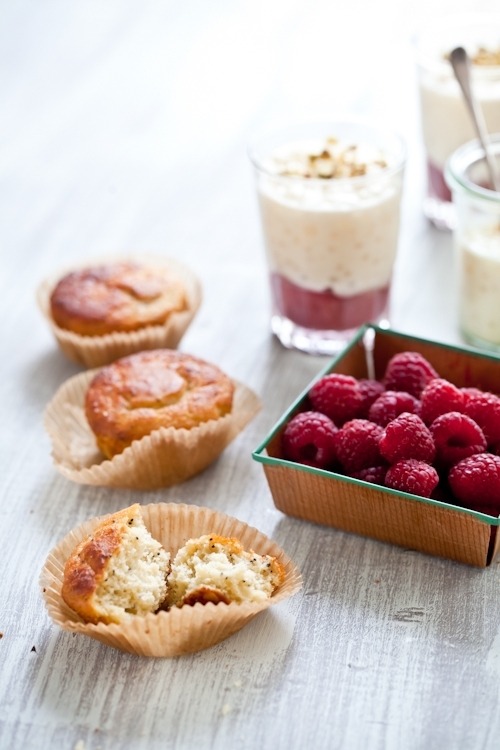 Let cool to room temperature and then divide evenly among 6 ramekins or glasses. In a separate and large saucepan, combine the tapioca, milk and honey over medium high heat. Bring to a boil then reduce the heat to low and let the mixture cook until the tapioca looks translucent (about 20-30 minutes). Let cool to room temperature and divide in between the ramekins or glasses with the raspberry/rhubarb mixture. Top with chopped pistachios. Preheat the oven to 350F. Line the inside of 12 muffin cups with muffin liners and grease slightly with melted butter or cooking spray. Set aside. In a large bowl, whisk the eggs and honey until smooth. Add the yogurt, lemon juice and zest, olive oil, coconut oil and whisk until combined. Add the millet, brown rice, and potato flour, salt, baking powder and poppy seeds. Whisk until fully incorporated. Divide evenly between the muffin liners and bake 15-20 minutes. Oh gosh, that pudding and those muffins look so mouth-watering... I love your photos; they're gorgeous. Can't wait until your book comes out! I can't wait to see the video, and I'll be watching for updates this weekend. Have fun, and I'm sure you'll do swimmingly. Congratulations on everything, Helene. It is well deserved. You had me at rhubarb, I just love the sour tang that it adds to desserts. Can't wait to see your book promo video! Love this post, Helene. 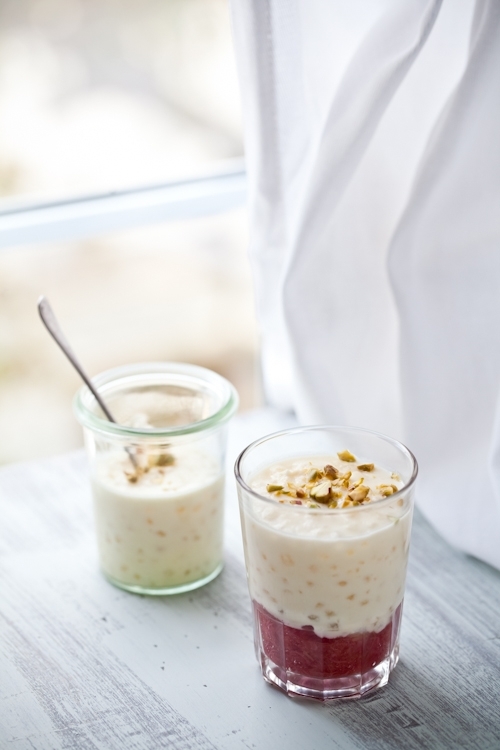 Those tapioca pearls look so good, and I love how you layered them like parfaits. These look amazing. It's bookmarked! And your photos are fab. But I will try the muffins instead. i want to try both now,just to feel good,..
congrats on your Elle feature! Wow, that's awesome, you deserve it, how cool! I'm still amazed by the powers of social media. Sounds like things have truly been taking off for you, which is lovely! Your post couldn't be more perfect for a nice spring day: light, seasonal, and bright. I've recently become Millet's #1 fan, so I'm happy to see it made it in the recipe too. How do you get your muffins so golden brown? They're beautiful! Oh, these sound so good! 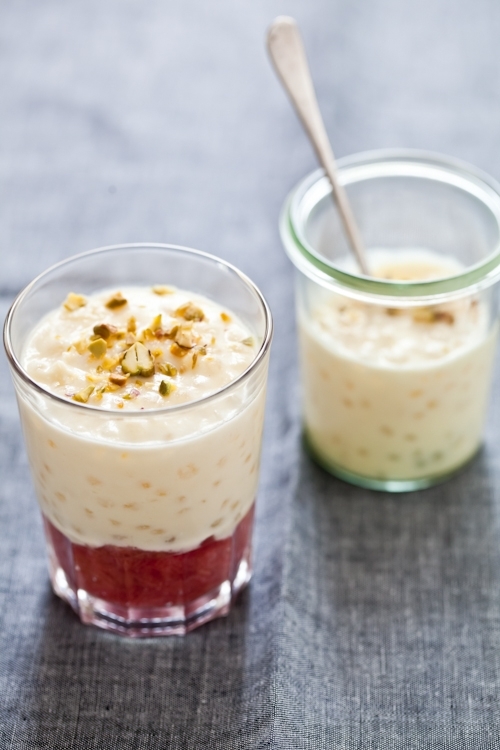 I don't think I've ever made tapioca pudding before, must try it soon! I am really excited about your book. Amazon tells me I should get it around the middle of next week! I have never had rhubarb before but I think now is the time to try it before its out of season again. Your photos make the cake look so delicious. Beautiful! I just discovered your website and boy am I ever impressed! It's absolutely gorgeous. I also just ordered your book! I've never tasted tapioca pearls before but seen it all over the blogosphere so maybe it's about time I did! I'm so looking forward to the video and book although mine will take a little longer to arrive :( I remember your last video and those few seconds already taught me so much like cleaning the edges of the plate with buds! So I can only imagine the treasures I will find in your book. That second photo is simply stunning Helene! what an interesting way to cook tapioca!!! loved it! Des photos à tomber comme toujours! Les couleurs sont superbes, et la rhubarbe hum! This is so exciting! Two of my favourites together in a recipe! I can't wait to make the tapioca pudding and rhubarb recipe. Looks so good! Absolutely beautiful, Helen. I love anything lemon and the muffins are crying out my name! Rhubarb is another favorite of mine, too. That video is so beautiful, I cannot get enough of it. I retweeted it back then to my Brazilian followers and they were mesmerized by it! I happen to love rhubarb but, even if I didn't, your photo of the rhubarb stalks would be enough to turn me onto a fan. Just gorgeous! Lovely as always Helene. Adore the light in these and I could really use one (or two) of these right now. Delicious combo! Gorgeous Post Helene! 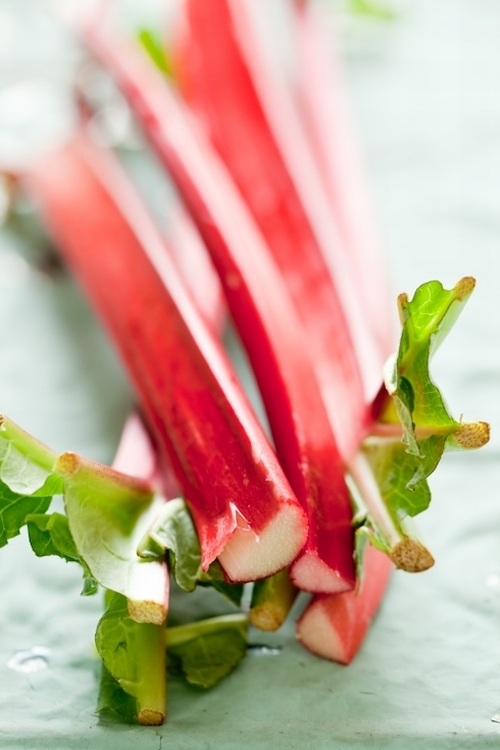 I love rhubarb and I can't wait to give this recipe a try... Anticipating the delivery of your new book! Happy Easter! I came across the Elle piece at the library Saturday - a happy surprise. Looking forward to making these recipes. With your gorgeous photos and recipes, i am sure you are ding-donged a lot all day. I already ordered your book from Amazon. Can't wait to receive it! I have not had rhubarb in years but certainly must change that! Can't wait to see your book - and the video shot by Taylor :) Have a wonderful day. congratulations on everything! enjoy your success--you deserve it! I've been waiting for your book for weeks, at amazon.co.uk it hasn't been released yet. I can't wait to get it! deliciouskitchenstories.com: the book is out everywhere online and in all the amazon. Thank you! Hi Helene - I rarely comment on your blog but always am a visitor. Just wanted you to know that I recently purchased your book on Amazon - and they just sent me an email saying that they just shipped it! Argh - only problem is that I am all the way in Australia! This is just one of those days when I WISH I lived in the US so I could get it sooner. Wishing you all the best with your book. I am sure if it is anything like your blog - it will be a hit! Yoni: increase the sweetener, whichever you like. We don't like too much in desserts especially with lemons but feel free to increase! Lovely recipe. I adore rhubarb. In fact I think Im addicted to it. Anyone know of any rhubarb anonymous meetings? I got a big bunch of organic rhubarb at the markets today, how handy! I can't thank you enough for your beautiful blog and all the effort you have put into creating the visual feast that is your beautiful new book. I am FINALLY emerging from a 10 year battle with Anorexia and I discovered your blog a few weeks ago. Words can't describe how instrumental it has been in helping me to gain back an appreciation of food and the joy it adds to our lives. Even in my darkest moments perusing your blog has helped me to see the light. You are helping me realise that I deserve a life full of love and laughter, not an anorexic "half life" full of deprivation and misery. You might find it hard to believe that your blog can have such a profound effect on someone half a world away in little New Zealand....but believe me it's true and I feel so strongly about it that I simply had to write and express my gratitude. I would dearly love to win a copy of your cookbook and the gorgeous plates. They would serve as the most wonderful reminder of my recovery milestone. Congrats for your nomination. Just voted for you. I'm just so delighted that I came upon your blog. 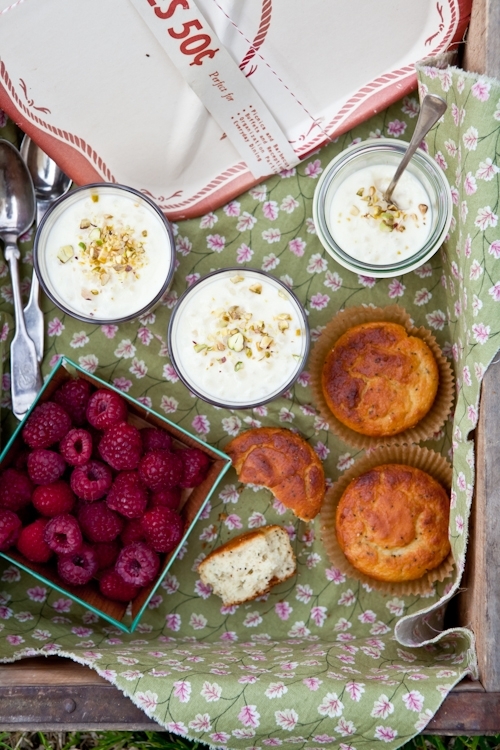 I would relish this recipe as I love berries and in a Rhubarb! Yum! Strawberries.. raspberries.. berries and berries... wonderful! Delicious! Great recipe. ne serait-ce pas possible d'avoir la recette en français, pour ces jolies verrines et pour le gateau au choco ? I made this beautiful, Spring dessert with soy milk and it turned out beautifully! I absolutely Love rhubarb and this makes for a perfect combination of tart and sweet/creamy! Hi Helene, I'd really like to make the poppy seed muffins but I want to use all purpose flour. Do I just use 2 cups total to sub the 3 different flours in the recipe? Thanks!! Caroline: yes, that's correct. I would sift it after measuring too. Food Blog Forum Orlando & A Sangria Recipe!